I continue to marvel at the many blessings being pouring out into our lives these days. After several years of feeling very much as if I was just wading along the water’s edge, retreating whenever the big waves loomed, I have taken up my word for the year* and plunged deep, striking out for the horizon and leaving the shore behind. If that sounds dramatic… well, it has been. The last six months have been an ongoing process of sorting through and setting aside the things that have accumulated around the edges of our lives and recommitting to the basics. It’s amazing to me how hard that is to maintain – the minutiae have a tendency to cling to our ankles and demand attention but we’re learning to deal with them more effectively, day by day. Even more amazing, though, is the way that life and purpose has begun to come into focus. It is so clear that I am in the right place, doing the things that I am meant to do now. Nick and I are having the most wonderful and exciting talks about what we feel God is doing in our lives and what our future holds. Our daughter, Danica, called me the other night just to talk – we had the most natural, normal and loving thirty minutes on the phone together, and I have tucked the glow and warmth of that conversation deep into my heart so I can revisit it over and over, like a small round stone in my pocket that my fingers can’t stop exploring. I can hardly bear to go to sleep at night – life is so good right now and I don’t want to miss a moment. My inaugural post at Art Jewelry Elements went up this morning – go check it out if you have a minute. It’s about the etching class I took with Gail at Wired Designs weekend before last. My etched brass earrings using the metal sheet we etched in class. I am also busily exploring the new design idea that came to me last week – and rather prolifically, too. The 2012 Rusted Gingham Barn Sale is just around the corner, and at this point my big concern is that I won’t have enough inventory. I am in awe of the people in the jewelry community who post photos in our Facebook gathering places and say things like, “Here are the 30 necklaces I whipped up after I put the kids to bed last night.” My mind boggles – I just don’t know how they do it!! So, there’s still a lot of studio time on the schedule, to the exclusion of most other things. * As I reread that post from January, I am really struck by how prophetic it turned out to be. I had no idea when I wrote it that I would be quitting my job in May, but it very clearly lays out the things that would turn out to be foundational in taking that step of faith. Unexpectedly, there’s even MORE big news! And life changes again. For the better. I’ve written a lot about the classes I’ve taken this year at Wired Designs Studio here in San Antonio. Gail Stouffer, one of the studio owners and the Director of Education, has been hugely supportive and encouraging of my efforts, and I have become quite fond of her. My time in the Wired Designs studio is always a jump-start to new ideas and new approaches to things I’m trying, and Gail is directly responsible for my newfound passion for glass cabochons. I feel really fortunate to have become part of that community of artists. Well, last week Gail got in touch with me and asked me to consider joining her team as a metal and wire instructor. I was floored – thrilled, excited, scared, and floored. We’re still working out the schedule and some of the details, but after the first of the year, I’ll be working with another instructor to cover the metal class schedule, which will include a boot camp that covers the essentials of metal with a design class that puts it all together. At the moment, it looks like I’ll be teaching anywhere from three to five classes a month and I could not be more excited. It was such a big deal for me to leave my job in May, to decide to follow whole-heartedly the path I felt God was setting before me, and to ignore the worry about money and provision that inevitably tries to creep in when we take such big steps away from “normal.” I have had Nick’s complete support in this and I have reveled in the unrestricted time to be creative and focused, but I admit that I have felt a little guilty and selfish to have been such a drain on our resources this summer. This opportunity is another encouragement to me that I am where I am supposed to be and doing what I’m supposed to be doing. Thanks so much, Gail! I’m looking forward this new phase of the journey! This is a truth that God has been walking me through. It’s ok to wait, and to be still, and not always to respond to every circumstance with an urge to “do” something. God is here. God is in this. 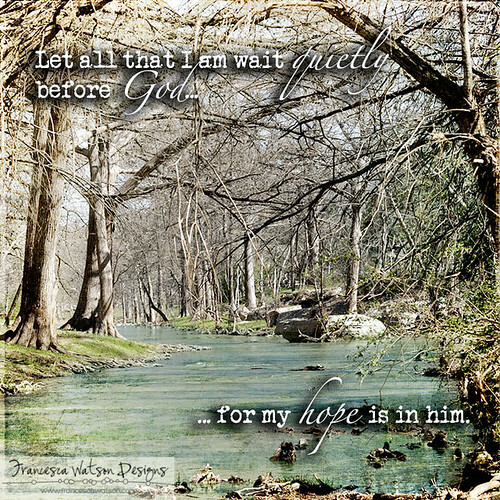 And my hope is in him.